It has been an interesting six weeks and I've missed being here. My daughter had surgery right before Christmas and then landed back at the hospital with complications. Once she was back at school I came down with Shingles. In the middle of all that I had another birthday, my first great nephew was born and my friend closed her darling cafe of which I have been a big part of. I'm reminded all the time that the one certainty in life is change, some good, some we see as bad but in reality is part of life. I'm thankful once again that the Lord is in control of it all, ready and waiting to see us through if we let Him. 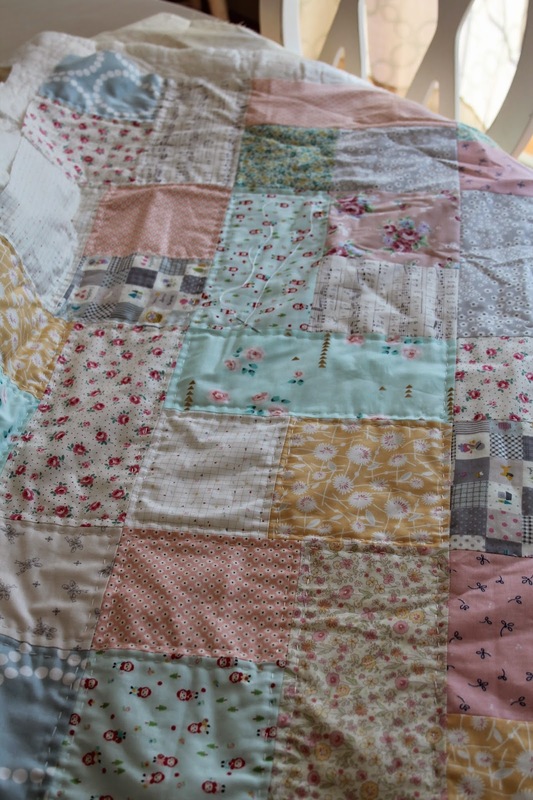 I started playing with fabrics and hand quilted a small quilt. I loved the entire process, mostly because I hadn't planned on making it at all. I finished a house block for the sewing bee I'm in and finally blocked my scarf. The picture does not give it justice. It is the most pretty combination of blues and reminds me of foam on the waves when I look at it. Praying you have a wonderful week! Sounds like there was a lot going on in your life. But you managed some lovely work! Beautiful quilt and scarf! 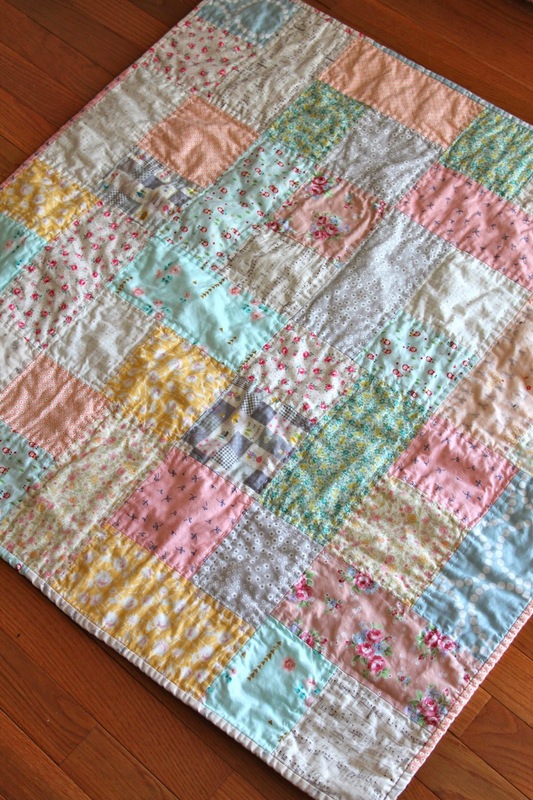 Sweet little quilt.You will have to model you scarf for us so we can get a true picture of how pretty it is. Yes, sounds like life has put a few bumps in your road. Thankful you have come through it all and that all is ok now. Congratulations on the new little nephew. Nothing like a new baby to sew for. I miss that. Always enjoy seeing what you are up to. Oh...love the door on your block...so clever. A new baby is always a blessing, congratulations on your new nephew. Hope you and your daughter are feeling a whole lot better. 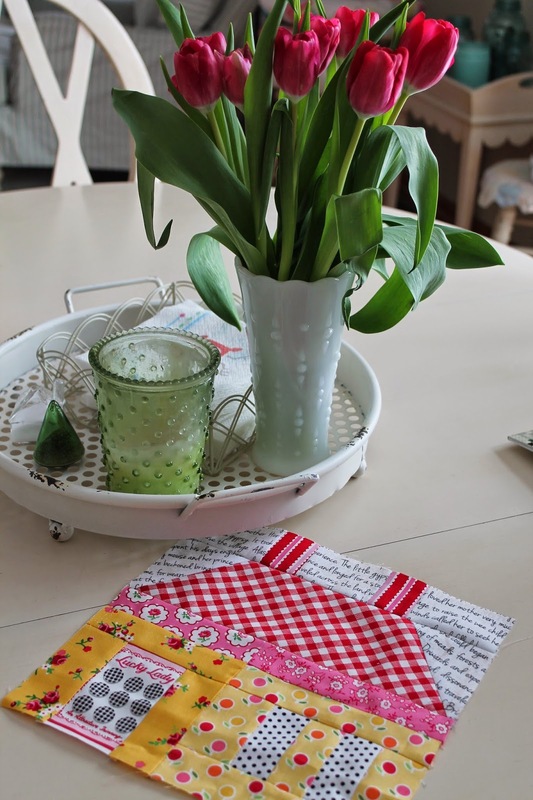 Your projects are stunning, I particularly love the hand stitched quilt, the fabrics are stunning, a real delight. So sorry to hear you had shingles Renee! I hope they have cleared up. 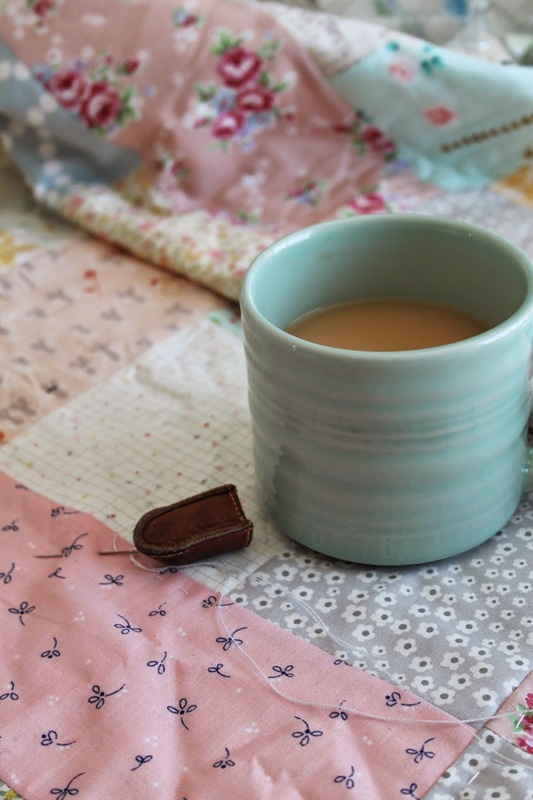 The little quilt is adorable, but the house block just makes my heart go pitty pat. Adorable is what it is! I love the scarf too, plenty of cold weather ahead to get some good use out of it! You had a very eventful January, hopefully February will be a bit calmer. Shingles! Ugh! I hope they are all gone! The house block is in my hot little hands. Thank you so much!! Glad things are going smoothly again Renee. Glad your daughter is well and back in school. Hope you are over the Shingles. They can be awful. Love the quilting and the scarf. So sorry to hear about your friend's cute shop. Prayers that your daughter's health is 100% again and that your friend moves forward from this setback on a new road that makes her happy. My husband had shingles and people just can't believe how painful it can be. I recently got the shingle shot and hopefully will avoid an encounter with it. The quilt is beautiful and I, too, have been working on an OLD top I got at our quilt show last fall. Working to improve my hand stitching on it and find it very relaxing. Sometimes the best thing we can do is to SLOW down. Prayers and thoughts with you. Hope you and your daughter are doing much better. 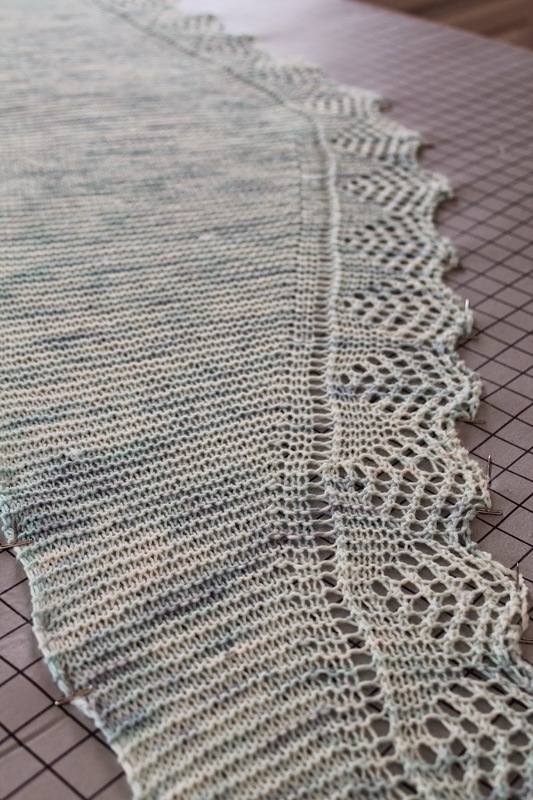 Cute house block and your shawl is lovely. I do believe we would be fast friends in real life. You could help me to quilt and I could help you clean. Well, not really but I'd still let you help me quilt. I'm so sorry about all you've had going on. Change can be hard. I always say that I only like change if it's my idea. But here's the thing, some of the most wonderful things in my life came about because of changes that not only weren't my idea, but which were sad and/or scary. I try to keep that in mind now. Sometimes easier said than done. I hope you are all recovered from the shingles. My best friend from childhood suffers from them and assures me it is torture! Joy to me when I read Christian blog. Your projects are all lovely. I am happy that your daughter is better and back to school. I hope that you are recovering quickly. I plan to do a hand quilting project this month, it has been a while for me.